I celebrated Winter Break being over by giving myself the day off. What did I do you ask? I spent an entire day scrapping. I started by looking through my stack of photos, then browsing a few challenge blogs for ideas and inspiration. ScrapFIt and Frosted Designs stood out to me. I haven't played there is a while. Then I sat down to play. Pretty pleased with myself. I finished a 2 page LO and 2 single page LOs before my kids got home from school! These two here are of my older son's 7th Birthday. He was all about Star Wars. I guess I started it by suggesting we watch the original Star Wars movies...I made the invitations, and even remembered to save one which I placed on this first LO. This is my entry for ScrapFit Workout #83, Stars. The title alone made me think of ScrapFit, but there are stars elsewhere as well. 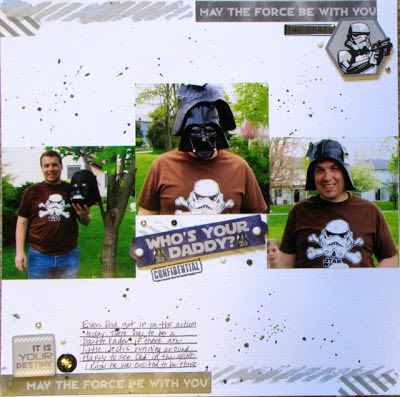 I started with this Creative Imaginations StarWars kit I purchased. How could I not use it? After i made the invitations, I saved the rest of package of StarWars "confetti". I knew I wanted to use it when I finally made these pages. Those are the Yodas on the banner as well as the small circular ones I pop dotted onto the Papyrus Washi Tape. THe banner is made of the embellishments from the kit as well as the cluster on the bottom left. All the little stars are Studio Calico wood veneer. They are from the galaxy, far, far away.....The focus is still on the photos, which are some of my favorites, but there is definitely a theme here! This is the last one from the party. It is also my entry for the Frosted Designs Recipe Challenge. These photos of my husband make me laugh. I think he was having as much fun at the party as the kids were! The Recipe Ingredients I used are brads, stamps, mask/mist and stickers. The rest of the StarWars papers were too busy, so I just used some of the embellishments (stickers). The silver stripes at the top and bottom are created from a Creative Workshop stencil and Heidi Swapp spray mist. I used a paint brush to paint over the stencil, adding some striped washi tape for definition. I also splattered some Mister Huey and Tattered Angels mist. The brads are in the clusters at the top right and bottom left, and also around the title sticker. The stamps are the journal lines and the "confidential". This page make me smile. I'm really happy with the way it turned out. Thank you ScrapFit and Frosted Designs for inspiring me. 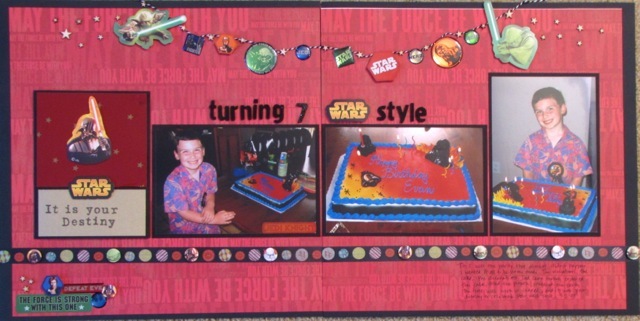 Love the Star Wars birthday layout! I like how you did the banner with all the embellies. The 2nd layout is cute with your husband. I like the Who's your daddy title. Hi Devra...saw your name on the posts at FD & wanted to drop by and say hello. I love both your layouts! Your dh is too cute and having fun w/ that helmet and I love how you've captured that memory!! Thanks for joining us at Frosted Designs! That banner is downright awesome! Super creative. Super cool layout! Love the title and the banner! Thanks for working out with us at ScrapFIT!